Private Home Decision Makers in Charge! There are older terms such as "vetting," "background check," "lookup," "screening," etc. However, years ago original participants with HGRBS agreed that if we are to approach screening contractor candidates in a more aggressive way, then it was best to create new vernacular to reflect that. It would begin with the initial stage of first contact with such candidates for work on our homes. Out of that grew the phrase: Service Validation. What "Service" considers is a contractor's willingness and ability to perform work on our properties and deliver consistent with what the contractor promises. But before we can really know if whether or not a contractor is all we expect, we need very specific information about him/her/them. 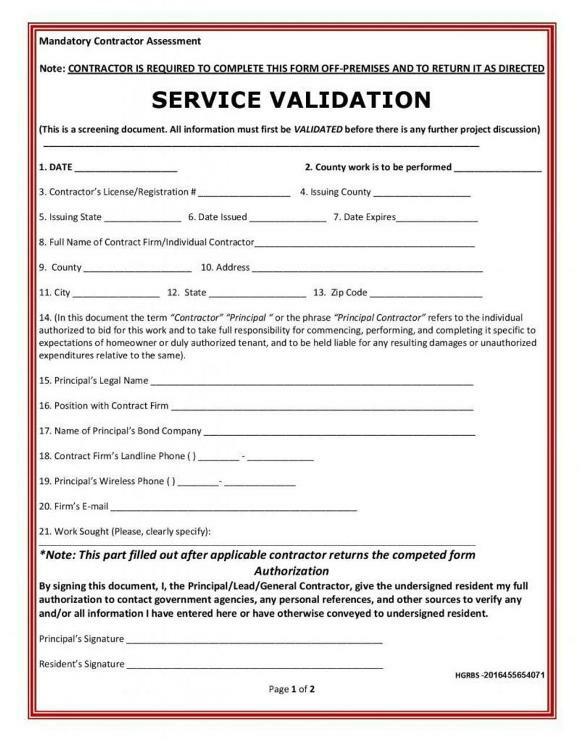 The Service Validation Form is a convenient tool we can use to collect that information from the contractor. It is in the category of a job application. It has not been standard practice for us to have them when considering contractor assistance. That has been a major error in the private home setting for more than 200 years. We use job applications as standard for people who are interested in working in the business world outside our homes, but we neglect having the same protective protocol before making decisions about contractor candidates who want to work in, on, or around our homes (which are significantly more vulnerable). The Service Validation Form resolves that issue when used for intended purpose: To personally gather key information FROM the contractor candidate. To "validate" generally means to "prove" or "verify." Certainly, we defeat our purpose gathering specific information FROM the contractor without having an intact program for validating everything the contractor entered. Summarily, when we require contractors to take the Service Validation Form with him/her/them to fill out ELSEWHERE, we are breaking the traditional mold. We are giving contractors applications to fill out FIRST. After contractors return them, we research or delegate research of the information they enter to ascertain if whether or not they are who they say they are and aptly credentialed to do what they promise. This process is called doing a "proper service validation." *In matters of contract-related home maintenance and improvement, the Service Validation Form is among the most crucial tools for us to use. This is the form which we physically hand to contractor candidates along with a numeric instruction sheet for filling it out. *It is recommended that we physically hand this form to the contractor to fill out ELSEWHERE, then to return it 100% complete with a MINIMUM five (5) recent residential references for whom the contractor candidates claim to have done the same or similar work. *Your “Service Validation Form,” is regarded as the FIRST contractor screening document proposed for standardization among private home heads of all 50 states (including the District of Columbia).